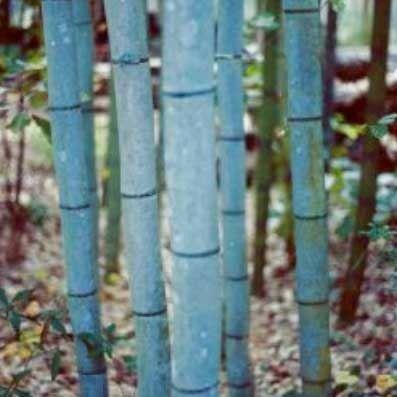 A gorgeous evergreen bamboo, also known as Blue Henon Bamboo, it was originally imported from China in 1909. This beautiful and unusual bamboo will make an excellent feature in your garden. Striking, tall canes (upto 3inches diametre after several years) and dark green leaves. The white powder that occurs on the outside of the stem forms a pale-gray, blue-green color. This is the most beautiful member of the Phyllostachys family that is drought and freeze resistant. The elegant canes look perfect in a any garden setting, and it's not overly invasive, making it an absolute must have plant. Very unusual, great in a container as well as the garden, or for forming a wind break/screen. The Japanese call this the 'light and volatile Bamboo' which sums up this plant admirably. It has widely arching and slender canes topped with masses of shimmering leaves. Tall and clump growing, it will respond well to feeding. Olive green canes turn to blue-grey with age. A gracious Bamboo with ethereal looks. This plant is supplied at approx 180cms (6ft) tall, with nice canes for instant garden interest.